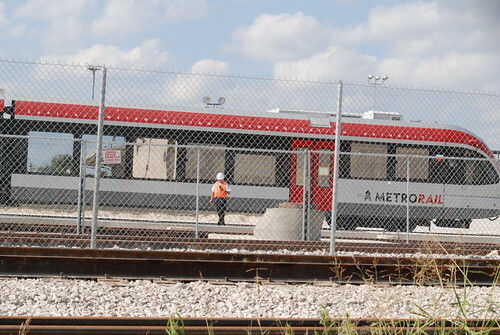 I saw two of these cars at the Capital Metro building near the train tracks. The guy in the orange vest yelled out to me to stop taking pictures. I smiled and waved at him. Click here to see more pictures. EDIT: I originally misidentified these cars as "light rail." doinky corrected me, saying that "These aren't light rail vehicles; they're diesel multiple units (commuter rail vehicles)." I've edited the title of this post to reflect doinky's correction. Why on earth would he want you to take no pictures from that distance??? I asked, in England, if I could take a picture of the interior of the engineer's car, and was told no, but that was quite understandable as they'd just had that bombing in London...and that's why I asked first, explaining my reason for wanting one. And said to the guard that I quite understood, when he said no. Didn't try to photograph behind his back, either. But just a picture like these is not something they can prevent, once the trains are running...it might provide a tiny bit of info to a terrorist but so would any picture of any car, bus, airplane, train.